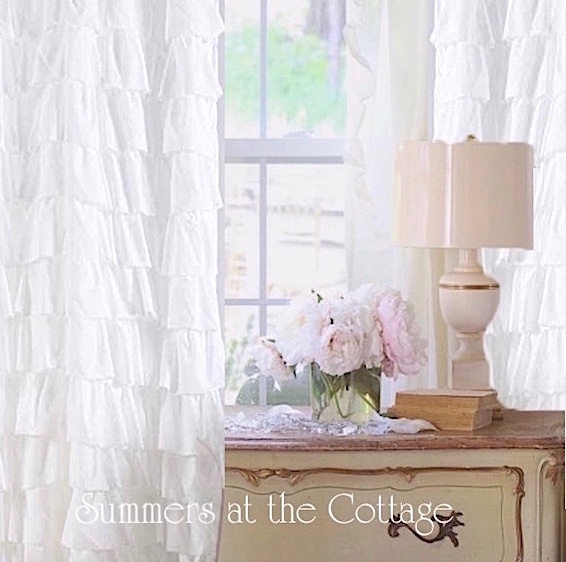 Romantic Shabby Cottage Window Treatments > SET OF 2 SHABBY FRENCH COTTAGE CHIC WHITE RUFFLE CURTAINS DRAPE PANELS 84"
Set of 2 curtain drape panels. Stunningly beautiful white ruffles. Each panel measures 54 wide x 84 inches long. Rows of dreamy white French cottage ruffles! Elegant chic drape panels created with a wrinkle resistant soft microfiber with layers and layers of pretty ruffles! Perfect for a shabby chic romantic French cottage home! Brand new, these gorgeous drape panels have a rod pocket for use with a curtain rod or can be used with drapery clip rings. Machine wash and dry.